The course should take around 6 to 10 hours of online study to complete. There is no pre-course knowledge required for the RYA Essential Navigation theory course. A basic course, this is for anyone new to sailing, motor boating, RIBs, powerboats, sea angling, diving etc. The online Essential Navigation & Seamanship Course is a fun, interactive way of learning the essential skills to get you started on the water, with a flexible approach enabling you to learn where and when it suits you as you have access to the internet. If you like the idea of taking the course in this way, please take a look at the Video Introduction. The RYA Online Essential Navigation & Seamanship Course is an inspiring online course for anyone interested in sailing, motor boating, sea angling or diving – or pretty much anything else on the water! The course is a basic introduction to navigation, seamanship and safety and falls below Day Skipper Theory within the RYA training scheme. It is ideal for users of small boats such as RIBs and dayboats such as those used by anglers. Its also a great course for those who are currently crewing on yachts & want to learn a little more before eventually progressing to the full Day Skipper courses. Click on the Booking Now button and you will automatically be taken to PayPal for payment after submitting our booking form, if you wish to pay by an alternative method please contact us. We will register and enrol you once payment is received. 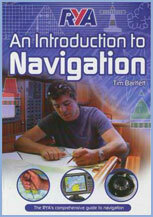 Online Essential Navigation & Seamanship Course costs only £99 including UK p&p. The Essential Navigation & Seamanship online course provides an introduction to the basic skills required before taking a small boat to sea or taking an active part in running a boat. CHARTS: publications & terms Basic terms, Chart overview, Introduction to chart datum & depths. 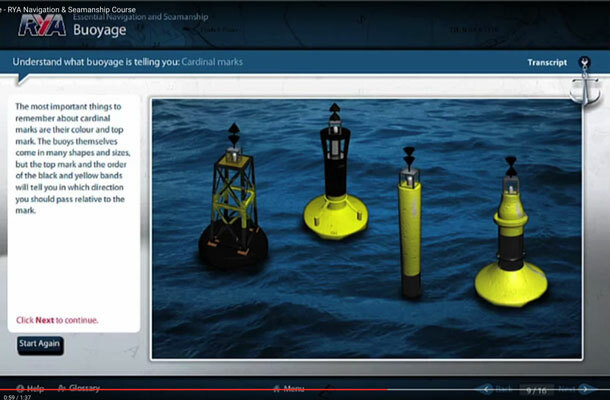 BUOYAGE: Lateral buoys, Cardinal buoys, Where to find information. NAVIGATION: Plotting a position, Measuring distance & bearing, Position fix, Heading. SAFETY: Personal & boat safety equipment, Safety procedures & briefing. COMMUNICATIONS: Engine checks, Rescue procedures. ANCHORING: Where to anchor, How to anchor. TIDES: Tidal streams, Tidal heights. ELECTRONIC NAVIGATION: GPS terms, GPS use, Using waypoints. RULES OF THE ROAD: Risk of collision, Who gives way. WEATHER FORECASTS: Sources of forecast, Terms used in forecasts. PILOTAGE: Harbour information, Transits, Pilotage plan. PASSAGE PLANNING: SOLAS V requirements, Pre planning, Chart choice. It offers the essential knowledge needed when you’re afloat & is a great introduction to navigation & safety awareness for new & inexperienced crew. Course topics include; Charts & publications, safety, engine checks, buoyage, tide awareness, visual & electronic navigation, pilotage, rules of the road, anchoring, weather forecasts & safe passage planning. Approximately 6 to 10 hours of online study required, you can complete the theory in your own time, at your own pace, in your own space, in the comfort of your own home, office, or surroundings. All you need is a computer & the internet. Many interactive exercises to help reinforce the information & lots of chances to try out what you’ve learned. On receipt of payment you will be provided with a username & password so you can access the course immediately, we will also post out to you the course pack which includes the RYA handbook, exercises & course information book, electronic chart plotter, practice charts, plotter & divider kit. On successful completion of the course you will also receive a certificate. An Introduction to Navigation is the latest in the RYA’s popular Navigation series. The book guides the reader through the basic steps of navigation so that they can learn to navigate successfully. It is therefore an absolute must for everybody, whether studying for the RYA Essential Navigation & Seamanship, or merely looking to refresh their knowledge.